Over the years I’ve heard a lot of students that are doing research, whether they are undergraduate or graduate, utter these words. I can’t recall with absolute certainty, but I seem to remember saying this phrase myself several years ago during my master’s thesis work. A few years ago the University of California Museum of Paleontology and its collaborators developed a fantastic flowchart simply called Understanding Science. 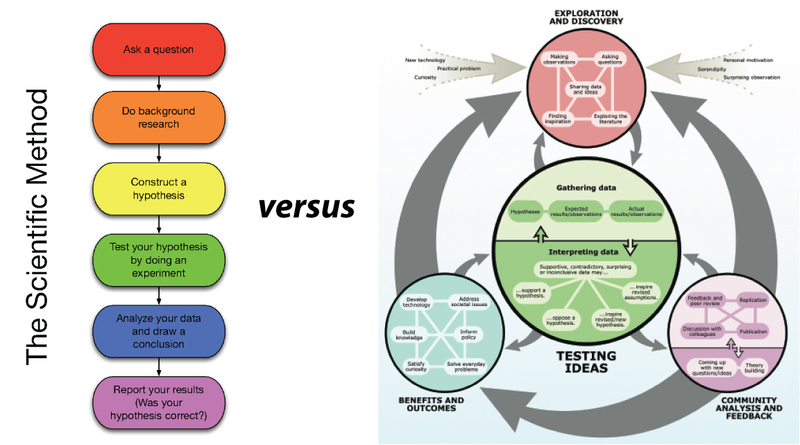 Compare this updated diagram of the scientific method (at right) with the traditional version I learned in grade school (at left). The key difference, of course, is the iterative nature of the diagram at the right. Anyone who has been involved in doing science knows that it almost never happens in the straightforward linear way depicted in the classic diagram. A researcher (or team of researchers) will constantly circle back to the motivating questions as they acquire information from the literature, conduct experiments/collect field data, and think about how their results fit into the bigger picture. Writing is a key part of this iterative process. Assuming you can simply ‘write it up’ at the very end may end up being a disastrous assumption. The act of writing is doing science. When you have to formalize the ideas into words it forces you to really think about what you’re doing. If you wait until the end to attempt to articulate this you may find that your analysis and data could be flawed. Most research projects involve a document in the beginning stages — a proposal of some kind, for funding and/or required as part of the degree program. This is great, but don’t leave it at that. Force yourself to put your research into words during the process, not just at the beginning and at the end. The best-case scenario is that these words will fold right into the final document, thus saving you time and effort at the end. The more typical scenario, however, is that the act of writing during the entire process leads to breakthroughs and epiphanies you might not have had otherwise. There may be milestones along the way that encourage writing — an abstract for a conference, an annual review required by the department, or from your adviser. These are fantastic motivators to get some words down on paper, but take the initiative and write without these more formal deadlines. So, my advice — and this comes from learning the hard way — is to write early and often because writing is doing science. Thanks for this Brian – I circulated it amongst my students for its inspirational value.